Scour at the base of bridge abutments during floods is a common cause of bridge failure in the United States. Shallow abutment foundations located at or near the channel banks are considered more vulnerable than other foundations because they are closer to the streambed and can significantly constrict flood flows. These types of abutments are frequently implemented for single-span bridges, and scour countermeasures are often integrated into the design to avoid placing the foundation below local scour depth. About 80 percent of the more than 600,000 bridges over water in the U.S. national bridge inventory are single-span bridges 70 to 90 ft (21 to 28 m) in length. (1) Therefore, to protect small single-span bridge abutments built on shallow foundations from scour damage, methods for countermeasure design are needed that consider the abutment foundation and scour countermeasures as an integrated component of the bridge. Extensive research has been conducted to determine the depth and location of the scour hole that develops around a bridge abutment. Design equations and procedures for estimating contraction scour and local abutment scour are provided in Hydraulic Engineering Circular (HEC)-18, Evaluating Scour at Bridges. (2) In recent years, risk-based design has been recommended in HEC-18. A risk-based design considers the need to provide safe and reliable waterway crossings while also taking into account the economic consequences and probability of failure. New bridge construction techniques also increased the need for guidance for design and construction of vertical-wall abutments on shallow foundations. The Federal Highway Administration (FHWA) has promoted the use of geosynthetic reinforced soil-integrated bridge systems (GRS-IBS) founded on reinforced soil foundations (RSFs). While the study described in this report was not exclusively focused on this bridge type, an important goal was to specify appropriate application of riprap aprons for these systems and their abutment foundations. Contraction scour occurs when a channel is narrowed by a bridge opening where the abutments constrain the flow, as shown in part A of figure 1. The flow accelerates in the contraction, increasing the bed shear stress and causing removal of bed materials. The flow depth in the contraction increases until equilibrium conditions are reached. The clear-water contraction scour equation recommended in HEC-18 is based on a development suggested by Laursen that assumes the flow transitions from uniform flow in the upstream approach section to a different uniform flow condition in the contracted section. (2,4) In Laursen’s analysis, the contraction scour depth (yc) is a function of the design discharge (Q) through the bridge opening, the pre-scour depth in the opening (y0), the median bed material size (D50), and the width of the bridge opening (W2). The contraction scour and LTD of the channel are assumed to lower the streambed across the entire channel. The local abutment scour, ys, occurs at the abutment because of the turbulence caused in the flow by the abutment. Figure 1. Drawing. Effect of an abutment riprap apron on contraction scour. As shown in part C of figure 1, the adjustment of the flow to the change in bed roughness leads to an increased bed shear stress, τR, on the unprotected natural bed material, leading to a deeper contraction scour depth, ycR, than would have occurred without the riprap protection. This increased depth can cause instability of the riprap apron and may ultimately cause riprap movement beginning at the apron edges. The research study described in this report was designed to provide a more complete picture of the flow field and local bed shear stresses on heterogeneous bed roughness in the bridge opening. 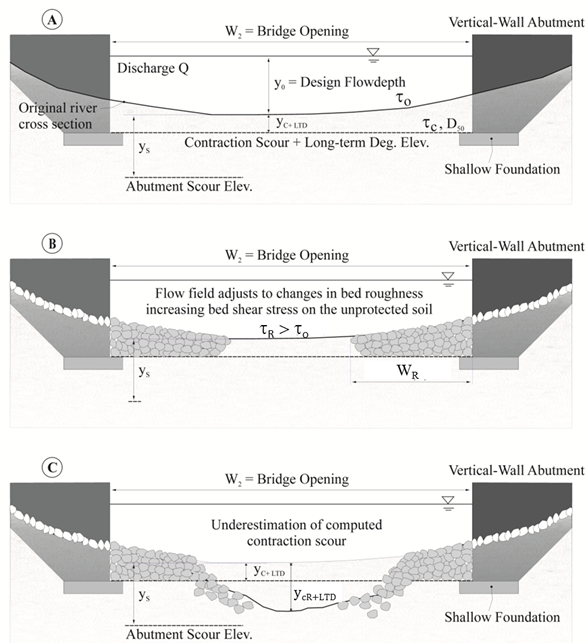 A series of physical and numerical simulations were conducted to achieve two main objectives: (1)quantify the change in shear stress adjacent to riprap aprons and (2) provide updated design guidance for riprap protection at vertical-wall abutments on shallow foundations in narrow contractions. In addition to this introductory chapter, chapter 2 of this report summarizes the annotated literature search for this study. Chapter 3 describes the development of a conceptual model for the increased shear in the middle of the contracted channel (bridge) section. Chapters 4 and 5 describe the setup and results of the physical and numerical modeling, respectively. Based on the conceptual model and the results of the physical and numerical modeling, design guidance for riprap aprons for vertical-wall abutments with shallow foundations is provided in chapter 6. Chapter 7 briefly summarizes this research and presents recommendations for future research. Appendix A is an annotated review of the literature. Appendices B and C present the equilibrium scour maps from the physical experiments conducted in this study and the computational fluid dynamics (CFD) sheer stress and velocity distribution maps, respectively. Appendix D presents proposed guidance on the hydraulic requirements for shallow abutment foundations developed based on this research.